Her lovely feminine head, sweet personality, and primitive stance were eye catching. She still has the lovely head and sweet personality. And her stance is even more eye catching. I wish I could have called this post “near miss” instead of “miss fortune”, but that’s not what happened. 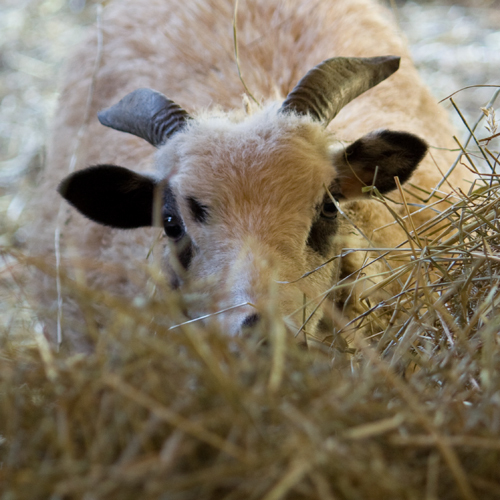 For the first time ever, I tossed an intact bale of hay from the loft into an area where sheep had access. There were no sheep around when I tossed it. But there was one there by the time the bale hit. Fortune came out of the barn at a full run. I figure the sheep are used to hearing me walk on the porch outside the loft door and then having flakes of hay fall from the sky. Sounded like a dinner bell, I guess. I heard a crack and knew that it was not going to be pretty as I rushed down the stairs. Just seeing her walking back inside the barn was some relief, but it was obvious the front leg was broken. Being late Saturday afternoon, there were no vets available. I called the emergency number, but didn’t hear back right away. With Dave holding her over his knees with her legs dangling, I splinted her leg from elbow to fetlock. A lease stick (cut into lengths) from my 24″ loom was just the right width for splints and had the advantage of neatly rounded edges. When I finally did talk to the emergency vet, she felt that, since there was no broken skin and I had splinted it properly, that waiting until Monday morning would be fine. I didn’t want her bounced around in the carrier on the way to the vet, so Dave stayed home and drove me to the vet – with Fortune straddled across my knees. She seemed to enjoy looking out the window! She was certainly alert and watching everything. Xrays showed some fractures in the knee in addition to the break in the foreleg, which is not good, as there may be fusing of the joint as it heals. The vet says there is a 50/50 chance that the leg will heal normally, which is the best case scenario. 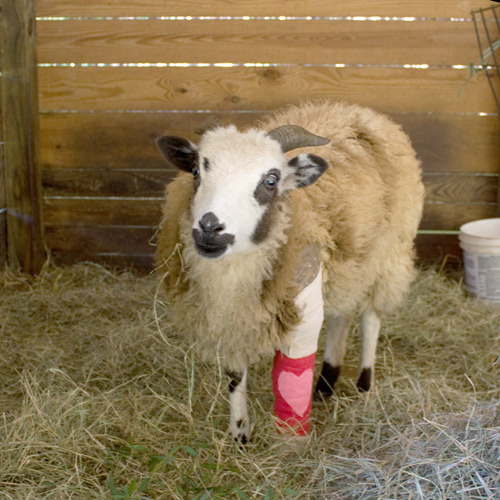 Worst case scenario (barring not healing at all, which is a very, very slight possibility given her age) is that the knee will fuse completely and she will have a “peg leg”, but should be comfortable, able to graze, breed, and raise lambs. Lots of degrees of healing in between best and worst and I can only hope for the best. She is quite content right now to have alfalfa that she doesn’t have to share. Her appetite is good (she is a little piggy! ), she is able to get up and lay down, and still comes hobbling up for a scratch even though I dropped a bale of hay on her. Oh my! The pink heart cast is pretty cute though ;-). 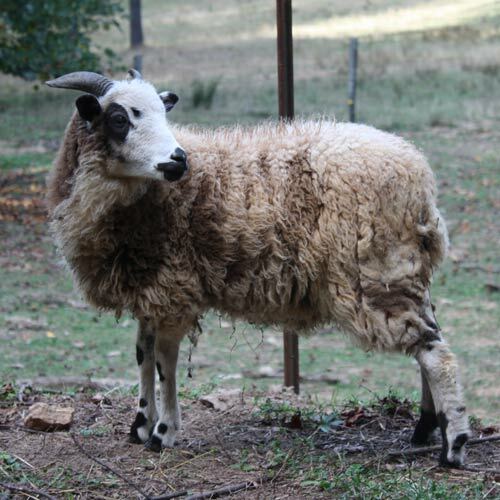 Nice ewe! I LOVE her cast 🙂 Such a special girl. I am sending good healing vibes her way. She is just adorable Linda. I am hoping that that joint does not fuse and that she gets total mobility in a month or so. She is absolutely adorable and such a sweetie. I hope she heals up ok. Give her an extra hug!! She’s a pretty little girl. Now she’s worth a fortune! So sorry that Fortune turned in to a Miss-Fortune (ingenious title, by the way). I sure hope and pray she heals well, and hey, you may have a very friendly favorite after this is all done!